Figure 1.1: The faster an object, the further it travels before hitting the ground. At the right speed it will never hit the ground and thus enter an orbit around Earth. because of the combination of its horizontal velocity and gravity pulling and thus accelerating the ball downward. Imagine throwing, or rather shooting, the ball really fast. Now it goes very far, all the way over the horizon. Because Earth is round, its surface drops away under the ball. The result is that the ball will fly farther away than if we lived on a flat world. At a velocity of about 8 kilometer per second (5 miles per second), the curvature of the ball's trajectory under the pull of Earth's gravity is exactly the same as the curvature of Earth. 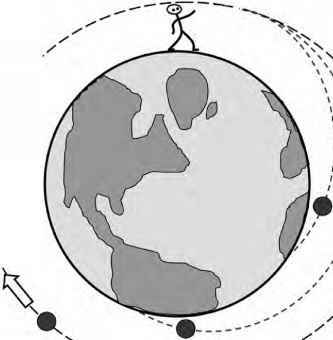 In effect, the ball is continuously falling around the world, never hitting the ground (Fig. 1.1). It is in orbit, and will return to hit you in the back! In reality you would not be in any danger, because Earth's atmosphere would slow the ball down so much that it would never reach you again. However, at an altitude of over 100 km (60 miles), there is hardly any atmosphere left to decelerate a moving object. In the vacuum of space the ball can circle Earth unhindered and become a satellite. Now imagine you are standing on top of a tower 200 km (120 miles) high. Figure 1.2: If a satellite is launched from a certain altitude with velocity higher than necessary for a circular orbit, it will enter an elliptical orbit. If you shoot the ball at exactly the right speed, it will get into a circular orbit exactly 200 km above Earth's surface. What happens if you shoot it away at a higher velocity? Then the satellite has too much energy and flies too far to perfectly match the curvature of Earth. It will nevertheless still return to its point of origin (the top of the tower); instead of a perfect circle, the ball's orbit is now a large ellipse. In this elliptical orbit, the top of the tower is the point closest to the Earth. This is called the orbit's "perigee" (Fig. 1.2). If you accidentally shoot the ball at a slightly too low velocity, the result would also be an elliptical orbit. However, now the trajectory is initially too curved to be a perfect circle, and the ball will drop down to an altitude of less than 200 km before returning to its point of origin. In this case the top of the tower is the orbit's furthest point from Earth, what is called the "apogee.'' If the velocity is much too low, the orbit intersects Earth's atmosphere. If that happens, the air drag will slow down the satellite even further and make it de-orbit. Perigee and apogee are terms used for Earth orbits. The generic terms are periapsis and apoapsis, but the prefixes peri- and ap- or apo- are commonly applied to the Greek or Roman names of the planets being orbited: perigee and apogee for Earth, perijove and apojove for Jupiter, periselene and aposelene for the Moon, and perihelion and aphelion for satellites, planets, and other objects orbiting the sun. Satellite orbits are normally changed with the help of rocket propulsion. 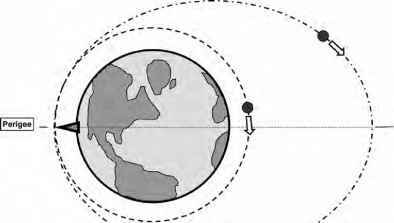 Speeding up a satellite in a circular orbit by thrusting in the direction of its velocity will make it enter a larger, elliptical orbit; the perigee stays the same, but the extra speed increases the orbit's apogee. You can also make the satellite follow a smaller elliptical orbit by thrusting in the other direction, in effect putting the brakes on. Now the apogee stays what it was (the altitude of the original circular orbit), but the perigee is much closer to Earth. Figure 1.3: A thrust impulse in circular orbit A sends a rocket into the elliptical orbit B. A second thrust impulse half an orbit later (at the new apogee) will then send it into orbit C, which is also circular but much higher than orbit A.
another, larger elliptical orbit, with the previous apogee becoming the new perigee. After each kick from the rocket's engine, the old and the new orbit thus always have one point in common: the place where the rocket was ignited (Fig. 1.3). Another important thing to know about orbits is that the higher the orbit, the lower the velocity required for a satellite to stay in that orbit. This sounds a bit contradictory, because didn't we need to speed up a satellite to move it from a low Earth orbit into a higher one? Yes, but the initial kick given to a spacecraft to increase its orbit's apogee only gives it a higher velocity at its initial altitude. As the satellite cruises along its new, elliptical orbit to a higher altitude, its velocity steadily decreases due to the gravity of Earth. Once it reaches its apogee, the spacecraft actually flies too slow to stay there; that's why it falls back to its perigee, which is at the same altitude as its original, pre-kick orbit (the common point of both orbits, where the rocket engine was originally fired). 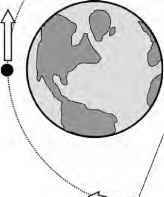 Falling down, it picks up speed due to the pull of gravity, and at its lowest altitude will move too fast to stay in a circular orbit there (in fact, at perigee it will move at the exact same speed it left with after the initial propulsive boost we gave it). It therefore moves back up to higher altitude again. If nothing else happens, the satellite will thus stay in this stable, elliptical orbit, constantly decreasing its speed on the way up, and increasing velocity on the way down (Fig. 1.4). Now, at the elliptical orbit's apogee, we again need to give our satellite a little extra kick to increase its speed sufficiently to make it stay at that altitude, in a nice circular orbit. Nevertheless, its velocity in this stable, higher circular orbit will be lower than its orbital velocity in the original, lower circular orbit. The extra energy we gave it with the first kick has been spent on gaining altitude, not on a higher velocity at that altitude (remember, the satellite actually moves relatively slow at apogee). If the force of Earth's gravity would be the same at any altitude, we would expect to require a higher horizontal velocity for higher orbits; a higher orbit means a bigger circle around Earth, which means a less curved trajectory, which in turn means a higher horizontal velocity. It would be similar to the example of throwing a ball: the higher the horizontal speed, the less curved the trajectory and the wider the orbit, and thus the farther away the ball flies. Figure 1.4: A satellite has its highest velocity at perigee and its lowest velocity at apogee. to Earth. In other words, because its rate of fall toward the planet is less due to the lower gravity, a satellite's horizontal velocity can be lower while its trajectory will still be sufficiently curved to avoid hitting the ground. The effect of gravity decreasing with altitude wins over the earlier explained effect of requiring a higher orbital velocity for a larger orbit. The net result is thus that the higher the orbit, the slower the satellite. Figure 1.5: A satellite that achieves a speed equal to or greater than Earth's escape velocity does not return to Earth but enters a new orbit around the Sun. velocity of only 1 km per second (0.6 miles per second). Because of its low speed and its very large orbit, it takes the Moon over 27 days to circle around Earth once. Since the strength of gravity diminishes with altitude (called the gravity gradient), and we can get to a higher altitude by increasing orbital velocity (increasing the orbit's apoapsis), there must be a speed that makes a satellite fly so far away from a planet that it no longer returns. This is called the escape velocity. 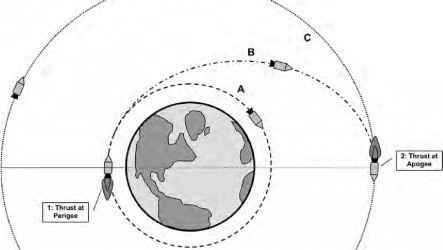 Below the escape velocity a satellite will follow a circular or elliptical, and thus closed, orbit. Above this speed limit the orbit is an open hyperbola and the spacecraft will "escape'' the gravitational influence of the planet (Fig. 1.5). Escape velocity -> hyperbolic orbit => satellite does riot return to Earth dominant, and the spacecraft will enter an orbit around the Sun. In such an orbit it may fly from one planet to another. For example, with the right increase in velocity a solar orbit that starts in the vicinity of Earth (the perihelion) can reach all the way to the orbit of Mars (the orbit's aphelion). 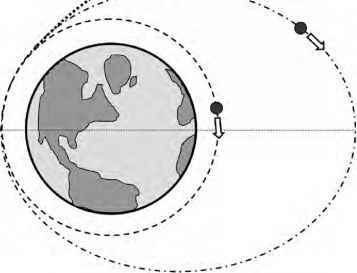 Using such an Earth-Mars Hohmann trajectory, we can efficiently send an interplanetary spacecraft to the red planet. However, we will have to boost the satellite out of Earth orbit at exactly the right time, so that when it arrives in the orbit of Mars that planet will actually be there, at the same location. Of course, the Sun has its own escape velocity. When this is exceeded, a spacecraft leaves the solar system and enters interstellar space. It will still be in orbit around a dominant center of gravity, though—the heart of the Milky Way, our own galaxy. Changing orbits by thrusting with rocket engines is expensive in terms of mass. For instance, bringing a 1500-kg (3300-pound) satellite from a low, 150-km (90-mile) altitude orbit to GEO with the efficient method described before takes about 4000 kg (8800 pounds) of propellant (using a typical spacecraft propulsion system burning monomethyl hydrazine and nitrogen tetroxide). This means that the total mass the launcher has to initially put in low Earth orbit is about 3.7 times the mass of the actual GEO satellite! Moreover, the propellant required for the transfer needs to be packaged into tanks that have a considerable mass as well, and also the mass of the essential pipes, filters, valves, structures, and rocket thrusters diminish the "useful" satellite mass delivered in GEO. 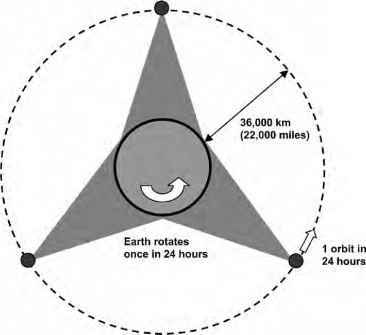 The GEO is a popular location, because seen from Earth a satellite in this orbit appears to hang more or less stationary in the sky (it will move north and south a bit, if not orbiting precisely above the equator). Such a satellite can thus be used to permanently observe the same half of Earth, or act as a giant radio/television tower. With three satellites, we can in principle cover the whole planet (with two satellites we would not be able to properly monitor the edges of the half globe observed by each spacecraft; some overlap is needed). Many weather and communications satellites are therefore placed in GEO. There are now about 350 active satellites in that orbit (theoretically three giant satellites would be enough, but those would be impossible to launch, and furthermore there are many different types of satellites and applications, operated by many different countries, organizations and companies) (Fig. 1.6). Figure 1.6: With three satellites in a geosynchronous orbit (GEO), practically the entire globe can be covered. Eurockot launcher, which costs about $15 million. To launch the same satellite plus the added mass for propellant and equipment needed for the transfer to GEO takes something like a Russian Soyuz rocket, with a launch price of some $45 million—three times the price of the smaller rocket. 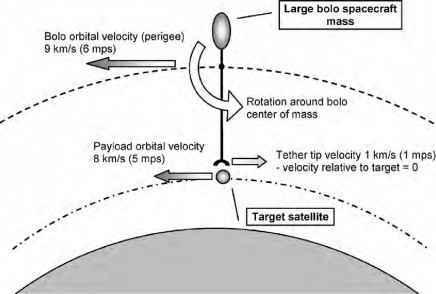 As we will see later on, the smart use of space tethers (using so-called tether propulsion systems) makes it possible to transfer satellites into the desired orbit with no or relatively little amounts of propellant, potentially resulting in important launch cost savings.